Today is The Ton’s First Anniversary Blog Hop, to celebrate all of the utterly incredible products brought to you this week by The Ton. I hope you’ve loved every post and project from this last week from the crazy talented Design Team members (who I still find it amazing that I can count myself among them!) because I know that I have absolutely adored creating everything, and reading your wonderful comments on my projects was just the icing on the cake! Thank you all so much for your kind words. 🙂 I’ve created five different (floral) projects for our blog hop today, so I hope you don’t mind seeing some more flowers from me! Let’s dive right in, shall we? My first project is one with which I was particularly happy. I had several ideas roaming around in my head all week, with lots of pieces stamped and cut out just floating around on my desk. I had a vague notion of what I wanted to make with this card: flowers, gold glittery stripes, bold black die cut sentiment, but nothing concrete. Then it just suddenly clicked, and I am so pleased with how it came out. To start, I used the Haute Stripes rubber background stamp to create a gold striped background using gold glitter embossing powder. I knew I wanted a variety of sizes and types of blooms, so I stamped several of the peonies from Fresh Cut Peonies using the Coral Couture Color Collection, as well as several roses from Fresh Cut Roses using the Ruby Couture Color Collection. I fussy cut all of the blooms and leaves, then die cut the “fabulous” from black card stock. I arranged all of the blooms in a swag above and below the sentiment, using dimensional adhesive to pop up the center bloom, and added a few sequins. My next project uses the same mint and lavender color combination from my post on day one of the countdown. The lovely roses were stamped with the Orchid Couture Color Collection, while the leaves were stamped with the Minted Couture Color Collection (CCC from now on! My fingers hurt lol.) The beautifully detailed vase was stamped with our Rose Gold Bangle pigment ink (isn’t that vase just divine?!). 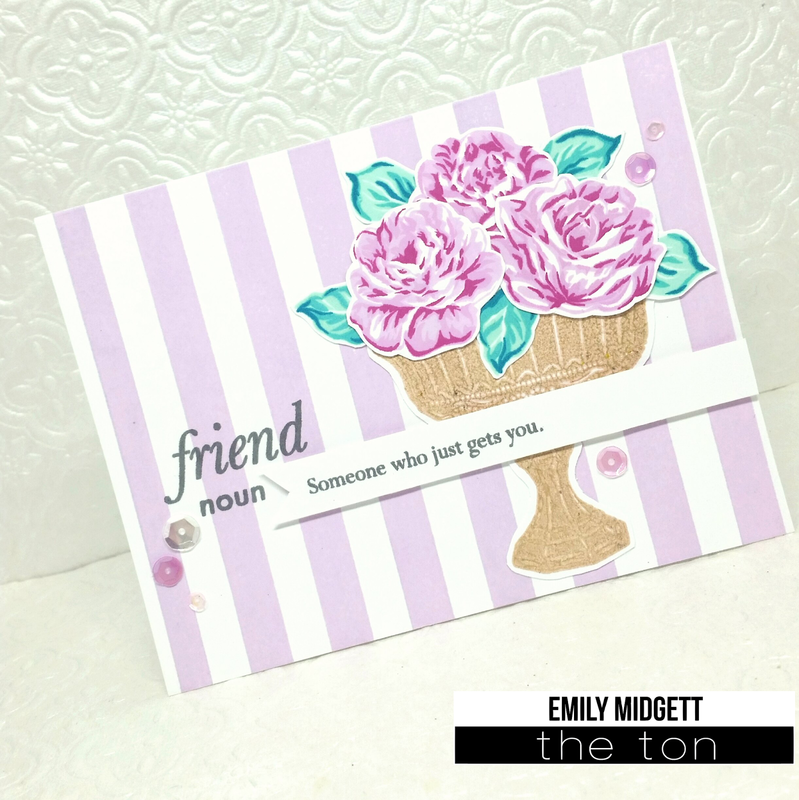 The simple white card base was stamped with the Haute Stripes background stamp using Soft Orchid ink. The sentiment, from Friend Defined, was stamped in Smoky Quartz ink on the card base, then also on a white strip of card stock, which I later flagged at the end. Some sparkly sequins in shades of purple finished off this monochrome project. My next project uses a technique that I absolutely love, but don’t often remember to do, because I don’t use Kraft cardstock very often…. I’m not a huge fan of brown, if you can believe that. To start, I stamped all of the bottom layers of the roses from Fresh Cut Roses using Hampton White pigment ink in a totally random pattern, which I zapped with my heat gun to nudge the drying process along. I then used the Ruby CCC to stamp all of the layers of the roses. I created one mask for each rose shape, covered my roses, and used the Hot Tourmaline ink to stamp just the bottom layer of the leaves. (It’s amazing how much lighter, but still vibrant, the ink shades are when stamped over the top of the white pigment ink.) I had a light pink oval on my desk from my pink and gold wedding gown project from Day 4, and I used that to stamp my sentiment in Noir ink. The oval die cut was looking a little bare, so I quickly stamped and fussy cut another rose and some leaves. I thought some twine would be appropriate given the shabby chic feel of this project, over which I adhered my oval die cut with dimensional adhesive. Some sequins in various shades of pink added a little sparkle. Now, this project might be my favorite from the whole release. (To say that I’m obsessed with these roses is a bit of an understatement….) As soon as I saw the rose and stripes stamps, my mind was flashing images of products from Rifle Paper Co. Flowers and stripes go together like peanut butter and chocolate. I’ve got about a gajillion things pinned on my “inspiration” board on Pinterest. I started by double stamping the entirety of the Haute Stripes on a square of white card stock with Noir Couture Color ink. By using my MISTI and double stamping the stripes, they’re so perfect that they look almost printed. My next step was to stamp the Fresh Cut Roses using the Ruby, Peony, and Citrine CCC’s and fussy cut them. (That was not a quick process for all of those flowers and leaves, let me tell you. But it was worth it, I think.) I stamped my greeting from Friggin Fabulous onto a white 6×6 card base. I had originally planned in arranging my flowers in a simple circular wreath shape, but I decided that, with all of the Valentine inspiration flooding my Instagram feed, I wanted to do a heart. I die cut a fairly large heart out of the center of my square striped panel, then popped up the stripe panel. I arranged my flowers the way I wanted them, adhered them, and finally added some sequins. If you’re still with me at the end of this ridiculously long post, thank you! I hope you’ve enjoyed these projects! The products released this week are so incredible, so you’ve certainly not seen the last of them on my blog!! Your cards are so pretty! love all the florals! All of your cards are beautiful but I think I agree about your last card…it is stunning!! Gorgeous cards! So bright and beautiful! I adore these floral cards. Spectacular! Beautiful cards. I really love how the flowers pop off of the black background. Love these! All this gorgeous color was a great way to start my day. Big, giant colorful flowers are the best. Pretty cards! You have your own flower shop! Gorgeous! Beautiful cards! I think the last two are my favorites….the flowers in the shape of a heart are stunning with the black stripes. And I love how the flowers came out on the kraft background! GIRL! Your mind is full of ideas like me!!! We don't have enough time to make it all happen on paper! 😉 I LOVE these!!! Amazing designs and colors! so much depth in those flowers! Beautiful cards! Thanks so much for sharing so many. Love the morning glory card design! Very unique! Beautiful use of the flower stamps! Great cards! I love how gorgeous all your striped designs look! Very pretty! Such LOVELY floral cards Emily!! Emily, you've blown the lid of that rose stamp. Love them all. These are all so gorgeous. I think my favorite is the Kraft card but then the heart with stripes is fantastic also. Your work is awesome!! WOW! Emily you rock these flowers! Share me your talent! I love the floreal design! Beautiful cards! Stunning cards! Thank you for bringing a little bit of spring to a very cold winter's day! My birthday wish is to come to your house for card making lessons. Every card you make is my favorite. The whole week you have had me drooling. it feels like Spring in here! 🙂 beautiful!! Beautiful cards! I just love stripes with flowers for some reason! Perfect combination! WOW, you really know your flowers. These are gorgeous cards. I cant pick a favourite card, they are all stunning! 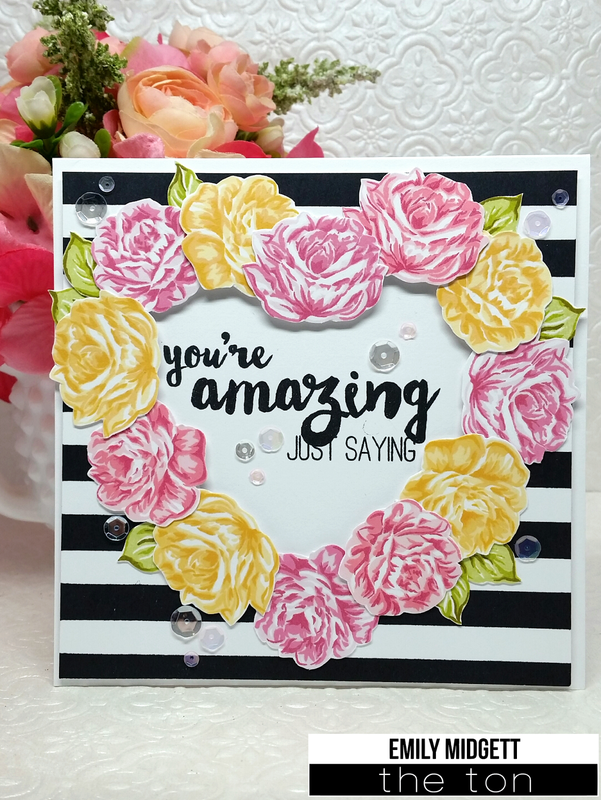 Love your embossed gold stripes and how soft all the layer stamped flowers look! Gorgeous cards! That floral heart wreath is amazing!! I love the contrast with the stripes and the color combo of the wreath is gorgeous! That heart wreath is amazing! Stunning! So beautiful! I love what you did with all the flowers? Beautiful cards! So inspirational. Nicely done as always! Love all your beautiful cards, especially the one with the soft orchid ink stripes. Love that color! loving the floral heart wreathe! Beautiful cards love the orange peonies, they are gorgeous. Thanks for sharing! Absolutely stunning. I love the peonies, they are my favorite flower, great color combo. You all are so talented, thank you for inspiring. OH WOW! I love how one set of stamp can be interpreted in so many beautiful ways. Thanks for sharing! All I can say is gorgeous. Just love the flowers. Thank you for showing all of your hard work. Beautiful cards. I love them all! Lovely cards thanks congrats on the anniversary. Such beautiful cards! I love your color choices! Wow those flowers! So, so pretty! You made some wonderfull cards, Like the Kraftcardstock one yiu made very much. Stunning cards! You are a master with florals! The morning glory card is simply amazing! So much beauty to drool over! That last one is my fav!! YOu really ROCKED these florals! AWESOME work!!! Your florals are beautiful. Thanks for sharing your wonderful cards. 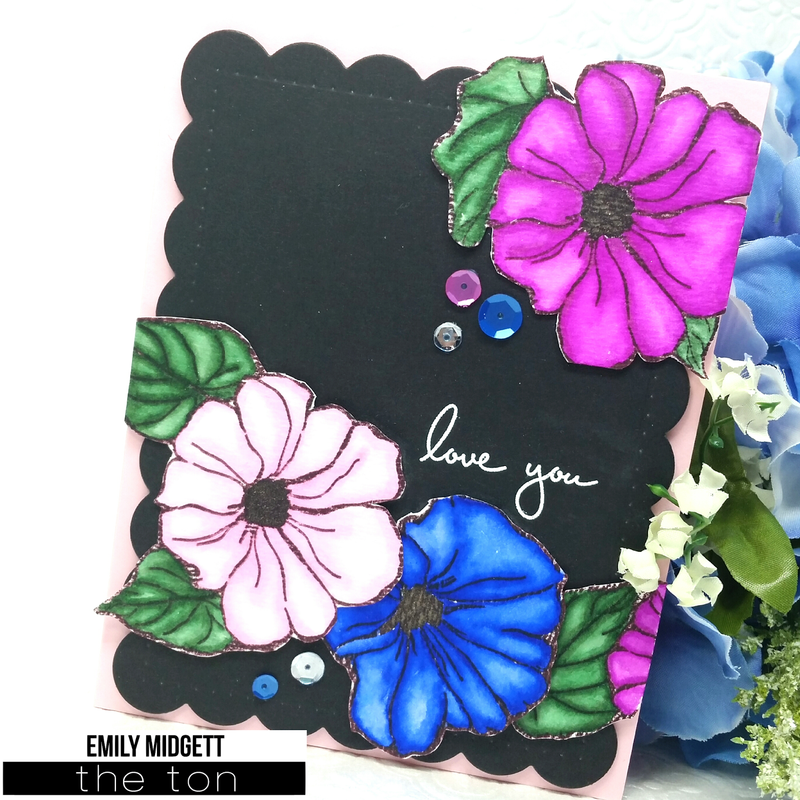 Hi Emily ~ I have fallen in love with those Morning Glories and love the vibrancy of colors you've chosen for your card. Those glittery gold stripes? Nothing short of awesome!! The vase and sentiments are all perfect for your creations. Thanks so much for sharing! Oh, these are all just so stunning! Fabulous job with all of them. beautiful work! my fave is the last one–pretty! WOW, your cards are STUNNINGLY GORGEOUS!!!! Specially your favorite which is mine also! All these cards are gorgeous! I love the peonies and roses, such beautiful colors and the haute stripes are awesome! Love the fabulous die too, so many goodies! 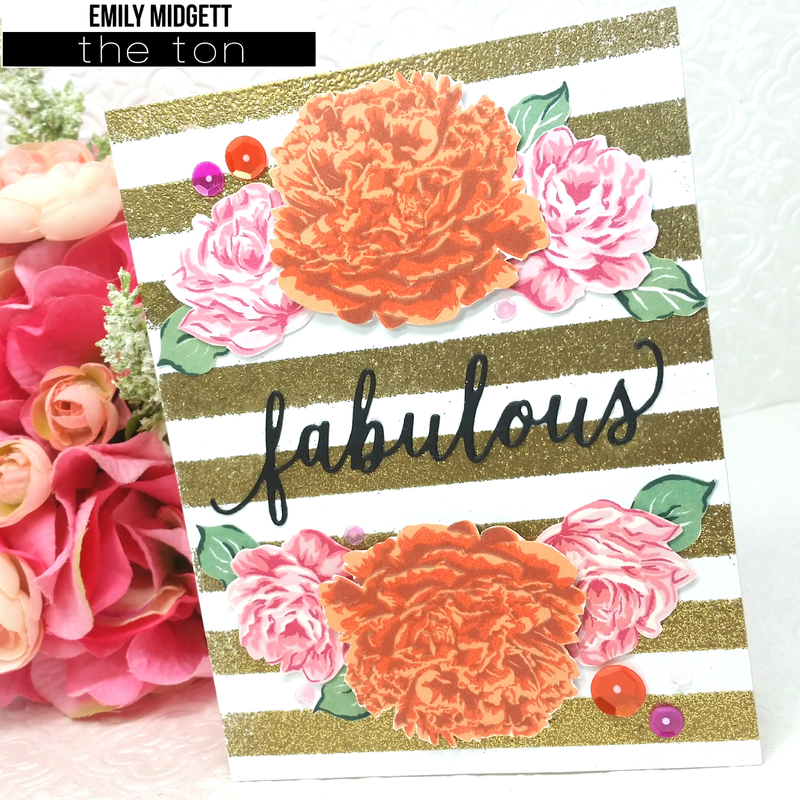 Love all this gorgeous floral, Emily! So much fabulousness here! Wow, your projects are so pretty. I love them all. Thank you for sharing you did an amazing job. Such beautiful cards – I especially love the black card! Lovely and sweet cards, just amazing! I love your mix of bold stripes with the pretty, soft flowers! Beautiful cards!! Love the beautiful stamped flowers!! Love the black card!! Wonderful cards, and my absolute favorite is the morning glories on the black base! It's evident you loved working on all these projects! Just beautiful. I love the stripes with the florals. Absolutely gorgeous, all of them! I especially like the flowers on the striped backgrounds! Love all the pretty looks! What terrific projects and they are loaded with techniques. Thanks for sharing your talent with us. Wowza Emily, these turned out just stunning! Love your cards! What a great job you have done! Emily, your cards are amazing and gorgeous! Beautiful colors for those flowers. WOW – ALL of your flowers are DELIGHTFUL, the designs BEAUTIFUL, SO MUCH to LOVE!!! … I think your 1st card is beyond FABULOUS, I ADORE it!!! I’m in love with your gorgeous cards!! Love all your beautiful floral cards! Fabulous designs from The Ton!